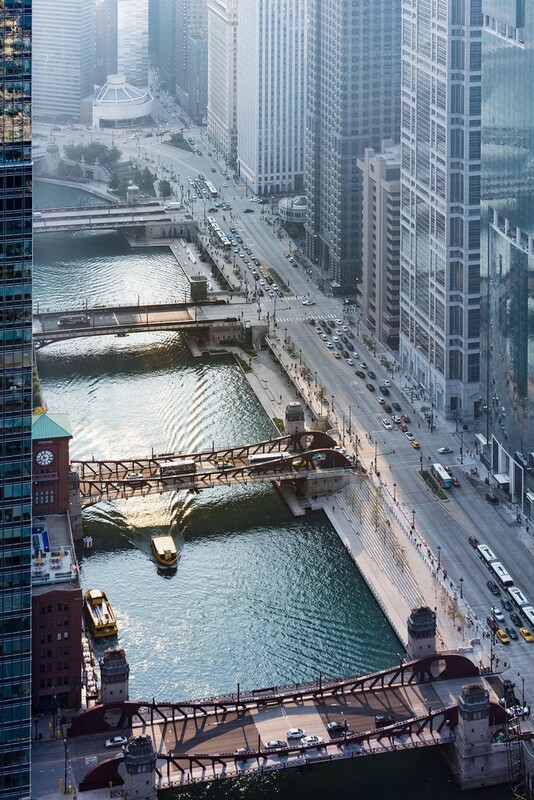 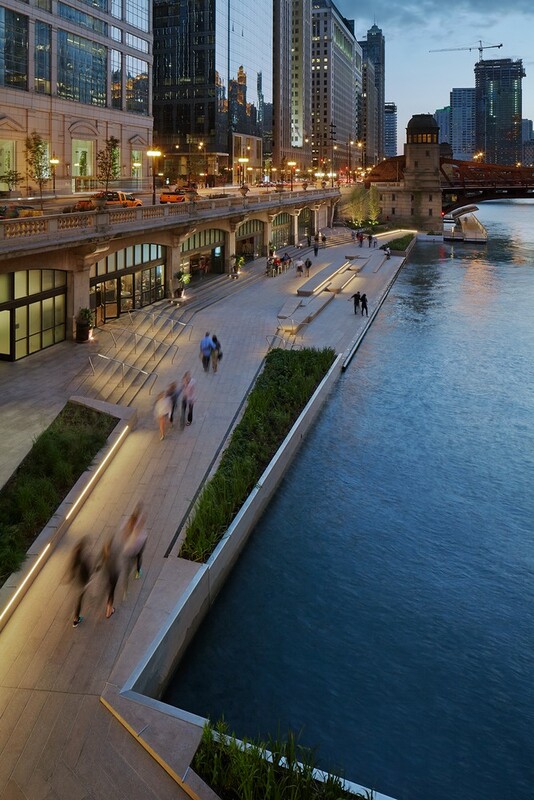 Chicago Urban River Edges Ideas Lab. 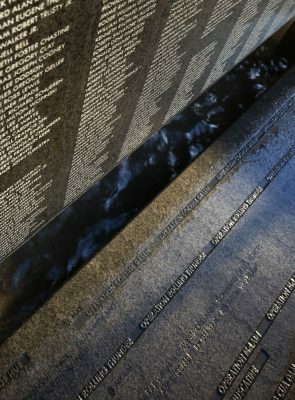 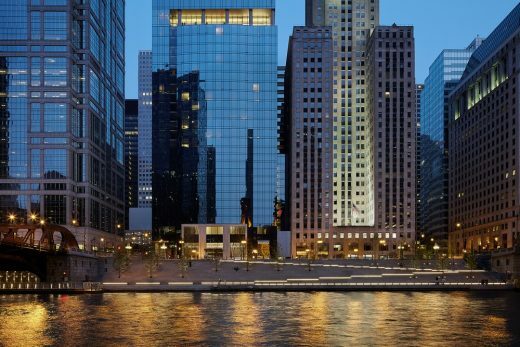 Ross Barney Architects along with David Adjaye, James Corner Field Operations, Studio Gang, Perkins & Will, and SOM, are among those participating. Building on the interest in getting people to the River and the success of our Chicago Riverwalk, both the Great Rivers Chicago and now this Ideas Lab have continued this excitement. 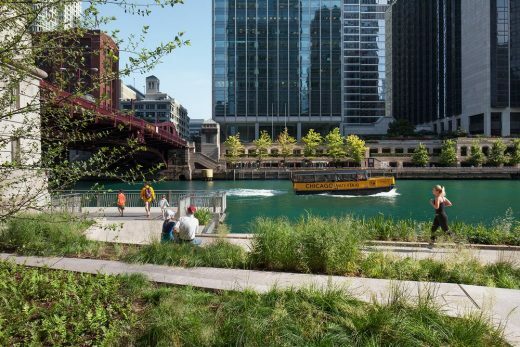 Mayor Rahm Emanuel, the Chicago Department of Planning and Development (DPD) and the Metropolitan Planning Council (MPC) today announced the Chicago Urban River Edges Ideas Lab, a collaboration funded by The Richard H. Driehaus Foundation and Comcast. The Lab will engage select architectural firms with experience in designing award-winning riverfronts, parks and public spaces to develop design concepts that will lead to a unified design aesthetic for Chicago’s riverfront. 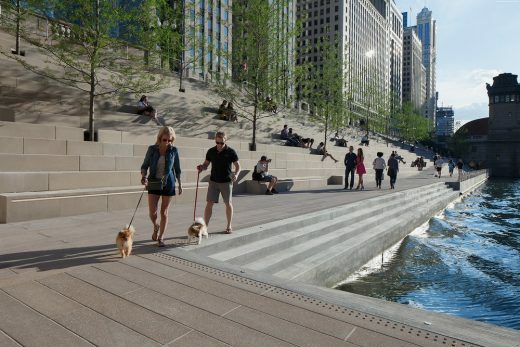 “When Mayor Emanuel asked MPC to lead Great Rivers Chicago almost two years ago, we knew it was an amazing opportunity to tap both Chicagoans and the design community for ideas on how to make our rivers more inviting, productive and living. 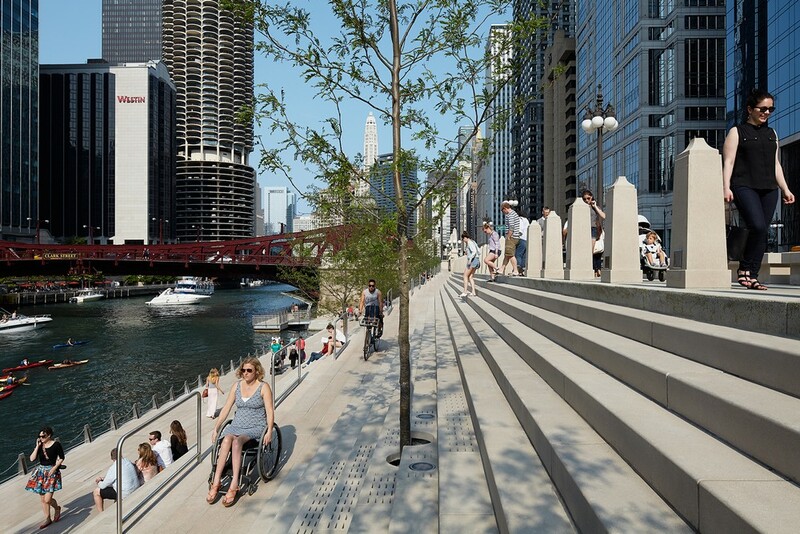 The Ideas Lab is an exciting outgrowth of that, and we’re pleased that the Ideas Lab designs and community response will inform DPD’s update of the City’s riverfront design guidelines, which was identified by Great Rivers Chicago as goal for the year 2020,” said Josh Ellis, Vice President at MPC and lead on Great Rivers Chicago, a partnership between the City of Chicago, MPC, Friends of the Chicago River and many other partners on the Chicago, Calumet and Des Plaines rivers. 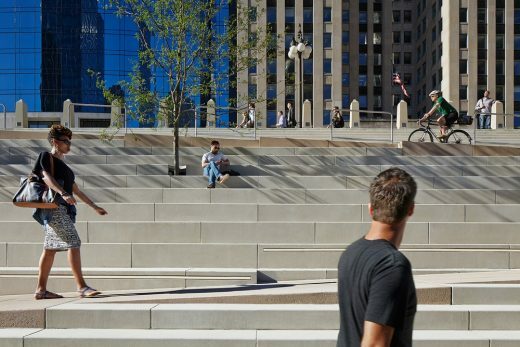 The primary purpose of the Ideas Lab is to gather fresh and innovative ideas from design experts and to excite and engage a local and global audience to provide feedback. 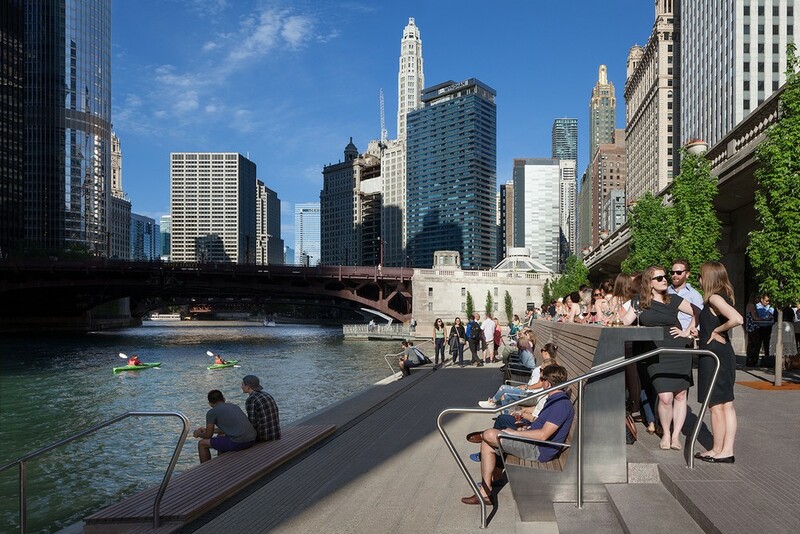 The Lab will engage six to ten leading architectural firms to develop renderings and design concepts for several typical river edge conditions found throughout the river system, using examples from the South Branch of the Chicago River. 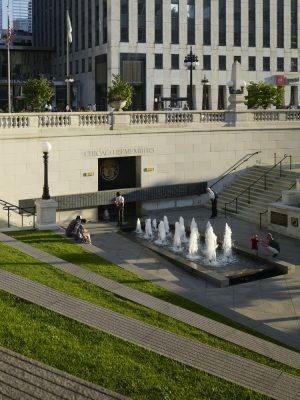 The selected firms all have significant riverfront experience and have demonstrated an ability to blend civic space, nature and opportunities for both solace and active recreation into their designs. 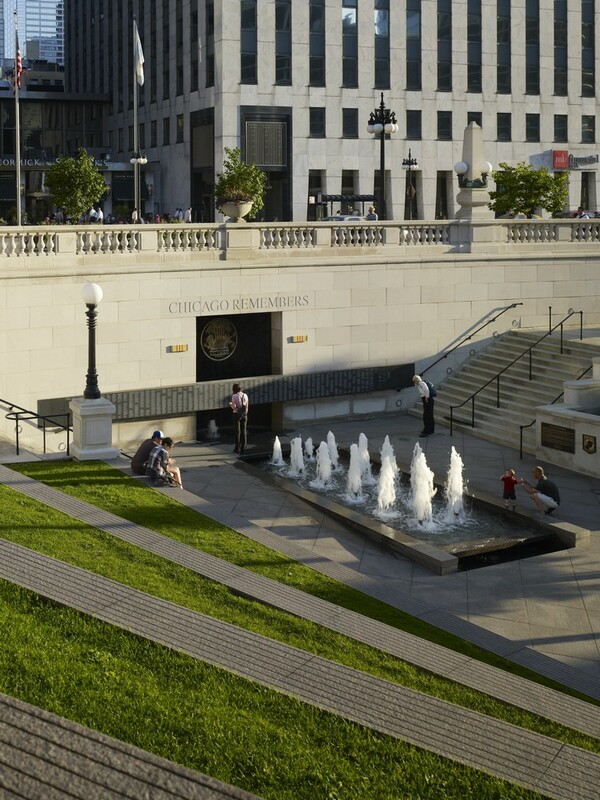 The idea development aspect of the Lab is supported by the Driehaus Foundation. 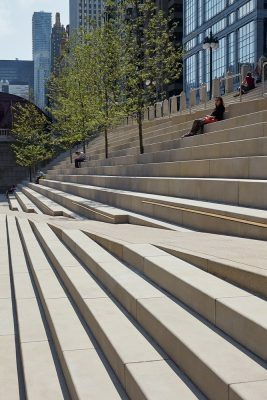 The architectural firms will submit their design concepts in June 2017. They will then be organized into an exhibition at public locations for review and public comment. 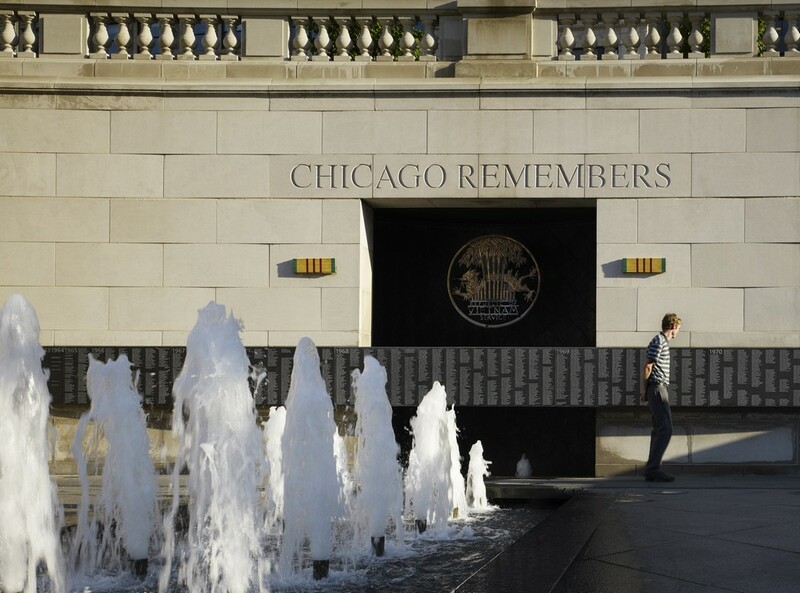 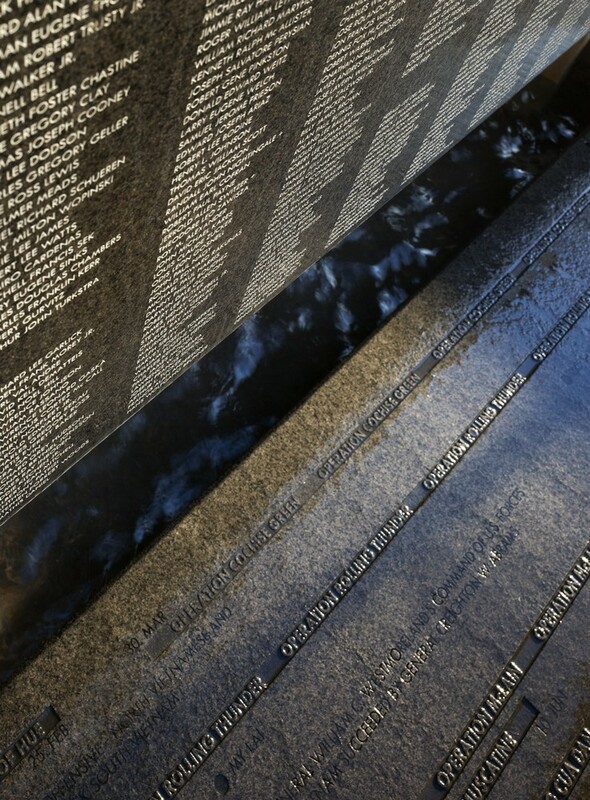 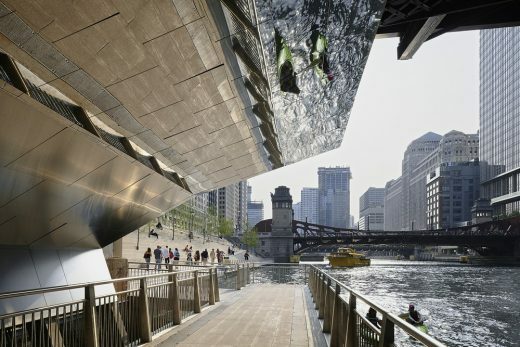 The concepts will also be displayed at the Chicago Architectural Biennial. The input collected from residents will provide DPD with invaluable feedback as they update the City’s riverfront design guidelines, which will be released in 2018. 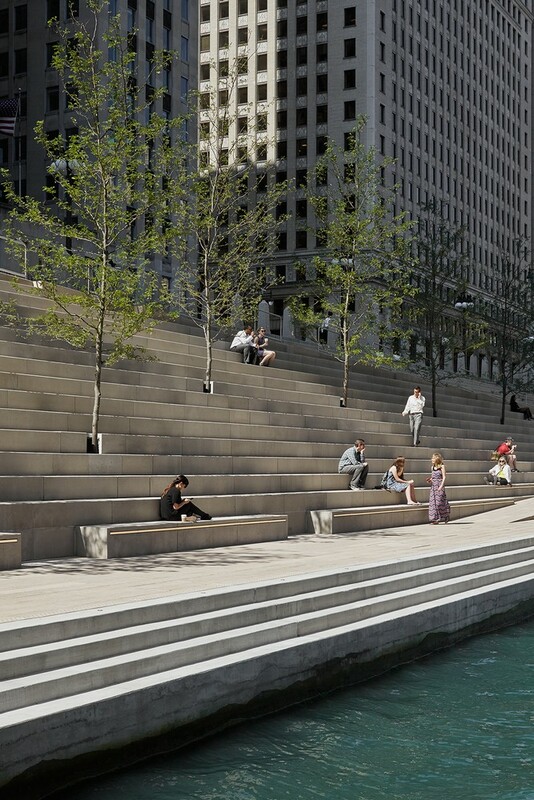 In addition to physical exhibitions, WSP Parsons Brinckerhoff will work with MPC to develop digital exhibition components, supported by Comcast, including viewing augmented and virtual reality via cell phones and physical installations using Owlized technology. 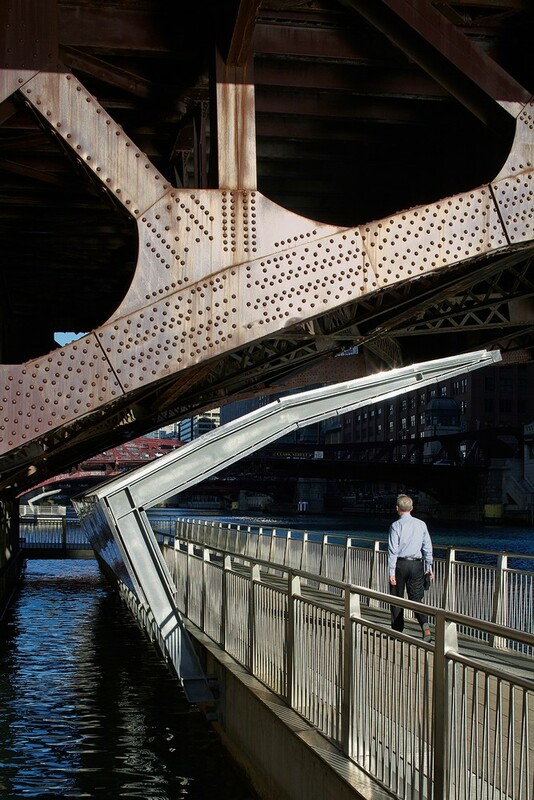 The launch of the Ideas Lab comes as Mayor Emanuel and Paris Mayor Anne Hidalgo are today convening 16 mayors from around the world for an Urban Waterways Forum in Chicago designed to foster an international conversation about the future of urban waterways. 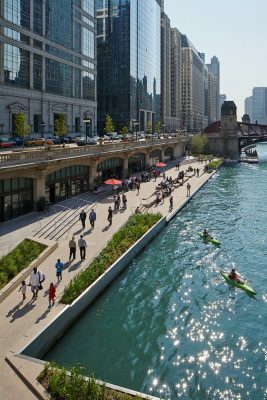 Urban waterways – whether on rivers, lakes, seas or oceans – have always been natural centers of gravity. 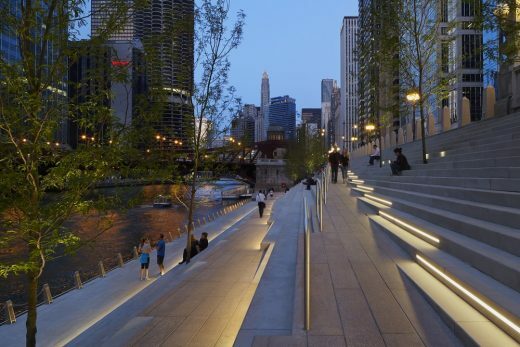 Over time, transportation and manufacturing have evolved and the old industrial waterways that turned into unused land are again ripe for new design, development and purpose. 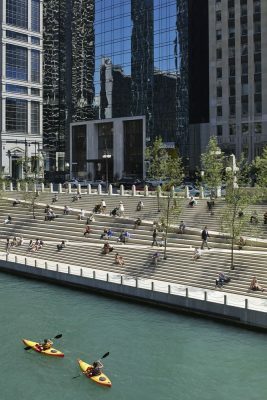 The final phase of the Chicago Riverwalk, designed by Ross Barney Architects in collaboration with landscape architects Sasaki Associates, is officially open to the public as of October 31, 2016. 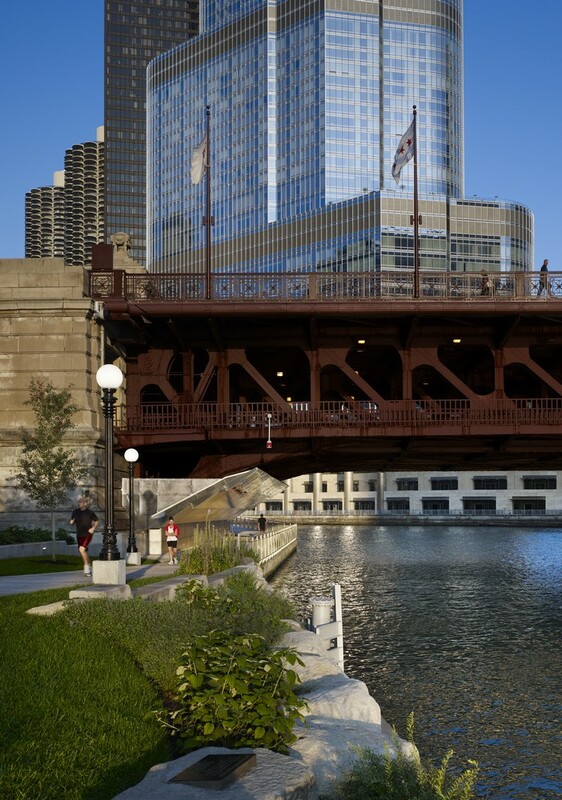 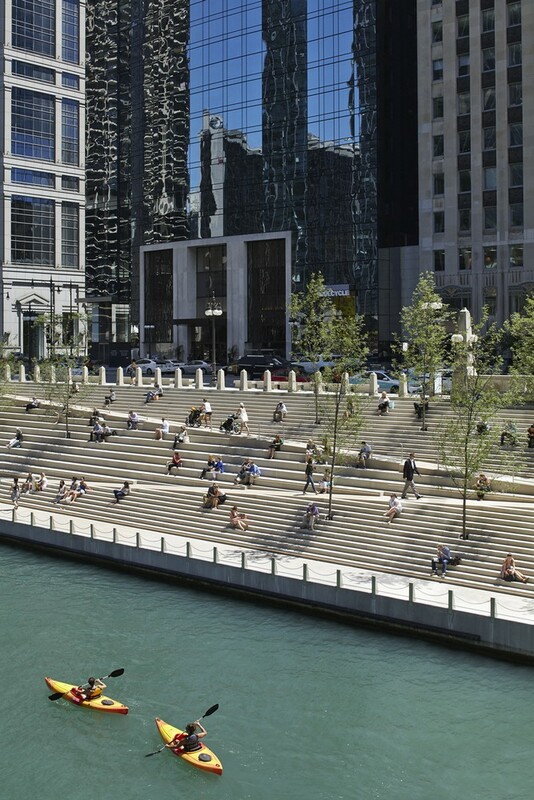 Once an industrial space in disuse, the Chicago Riverwalk, a 1.5 mile promenade along the Chicago River, has been transformed into a dynamic space lined with public amenities, restaurants, cultural activities and access to natural habitats for city residents and visitors alike. CHICAGO, October 22, 2016 –Mayor Rahm Emanuel and the City of Chicago celebrate a renewed commitment to the city’s waterways. For the past 15 years, Ross Barney Architects has been the City’s partner in imagining, re-inventing, and strengthening connections to the rivers that course through its diverse neighborhoods. 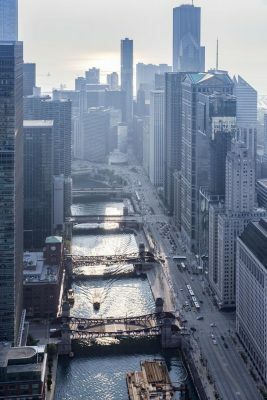 – A report entitled Our Great Rivers, which has become Chicago’s first unified vision for the Calumet, Chicago, and Des Plaines Rivers. On August 17, 2016, Our Great Rivers, Chicago’s first unified vision for the Calumet, Chicago, and Des Plaines Rivers, was unveiled. Ross Barney Architects worked in collaboration with the Metropolitan Planning Council, City of Chicago, and a host of advocacy and government organizations to promote ecological research and stewardship of an invaluable regional asset. The entire river system has steadily gained a vocal collective of advocates, all looking to reconnect the daily experience of the City with the dynamic and changing life of the River. 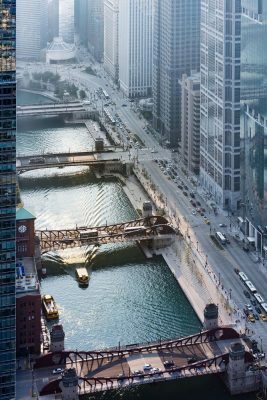 With over 150 miles of riverfront and 70+ species of fish, the river is an evolving ecosystem of inestimable natural value. By reinterpreting the relationship to water, the report focuses on five place-based examinations that manifest new dimensions and perceptions. 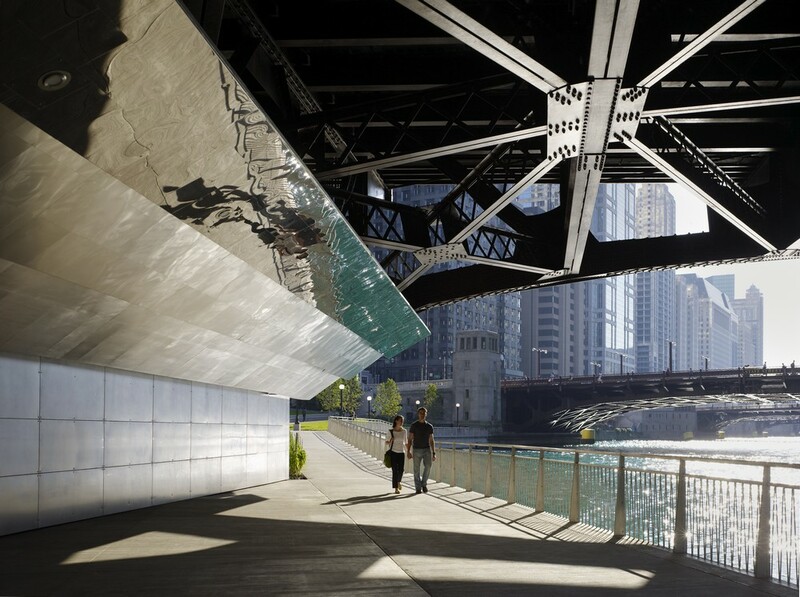 From the suburban context where the connection between office park, transportation, and forest preserve is knit together by a riverfront trail to the Post-industrial south canal that now flows adjacent to thriving residential neighborhoods that offer a unique relationship between river, production, and commerce. System wide in its scope and recommendations, Our Great Rivers is the start of an evolving perception and deep appreciation of Chicago’s second shoreline. 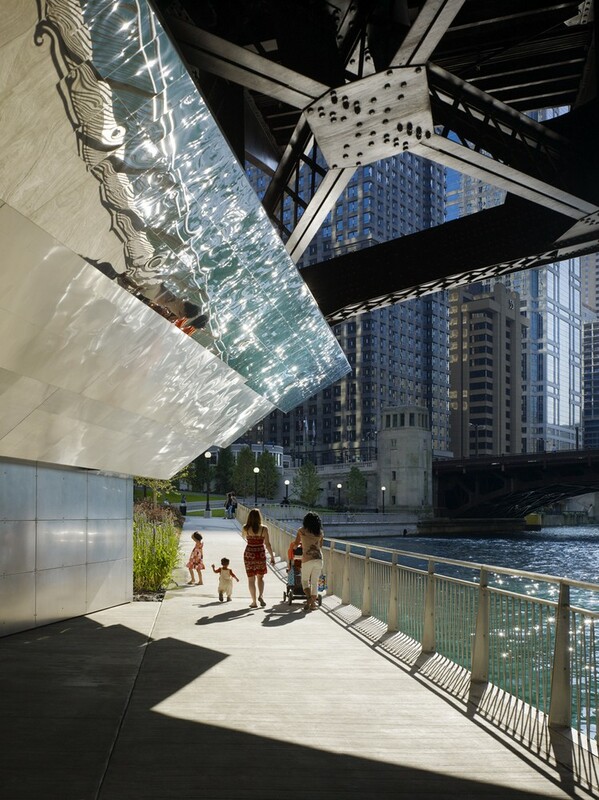 The final phase of the Chicago Riverwalk, designed by Ross Barney Architects in collaboration with landscape architects Sasaki Associates, opened to the public on October 22, 2016. 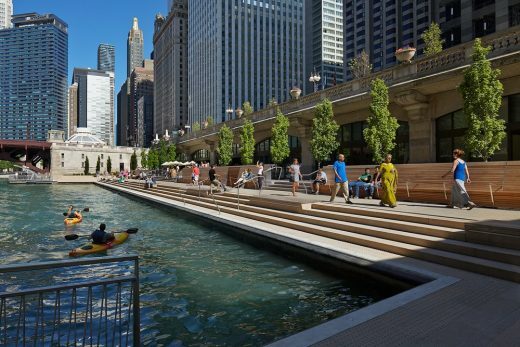 Lead Design Architect for the 15 year project Carol Ross Barney, FAIA said the goal of the project is to “return the river to Chicago and return Chicagoans to the river. 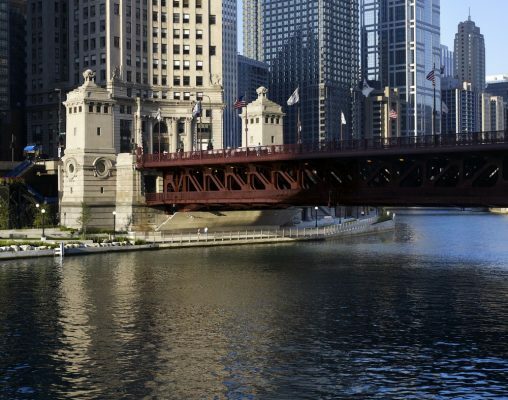 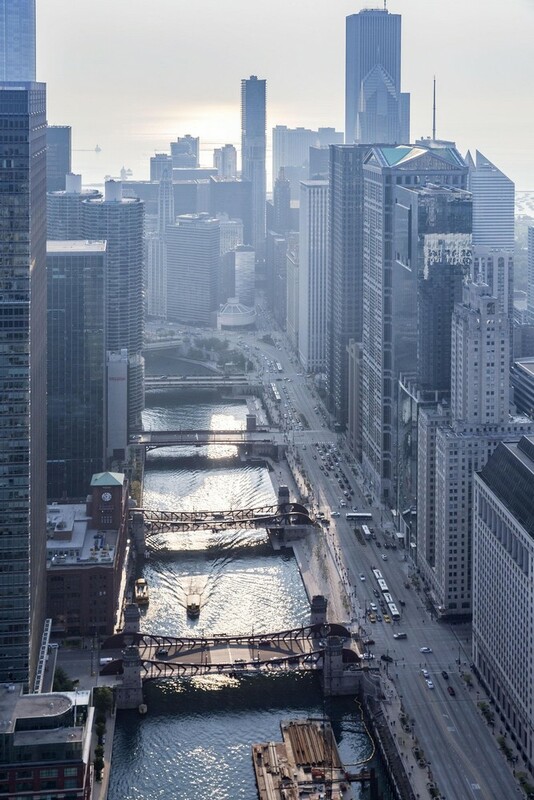 The swampy Chicago River gave birth to arguably the greatest city of the 20th Century.